I love graphs. Especially when they show a steady downward trend! 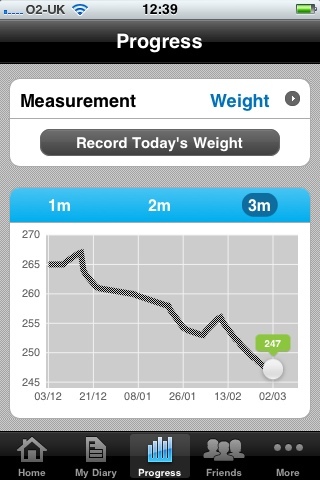 This graph from MyFitnessPal (allana3uk, if anyone fancies buddying up) shows my loss over the last three months. You can see the occasional blip where I’ve had a stressful week and resorted to comfort eating, but I’ve managed to get myself back on track each time. That’s what I’m proudest of. So, here’s to another three months of trending downwards! I wonder how low I can go? So proud of you Ang! I got the message that you started to follow and I don’t know if I knew you started a blog. I think your progress is great so far! Keep it up! I don’t think I’ve mentioned the blog on FB… maybe I will when I get a bit thinner! Thanks so much for stopping by!